Last night Genevieve's best friend from school stayed overnight. It was the first non-family sleepover for both of them. They had such a good time. Anna was amazing--never a hint of homesickness. The two girls giggled and talked late into the night, as you would expect. 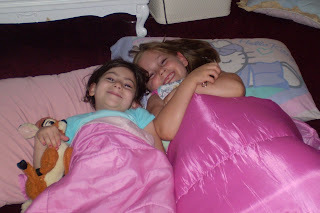 They started out on the floor in sleeping bags and ended up sharing Genevieve's twin bed. Then they were up super early in the morning and picked up right where they left off. I overheard this conversation this morning: "I wish we could be sisters." "Then you would never have to leave." "And I could go on trips with you." "We could be twins!" "Yeah, that would be great!" Wow, this is a whole new phase. We've definitely moved on. She's gone from mama's little girl to schoolgirl with her own life. I remember those days so well. 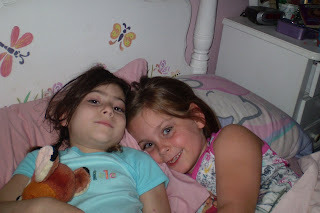 I had a best friend too, and we used to sleep at each other's houses all the time. I hope this friendship lasts at least as long.